He was charged with public intoxication. The possum at the time of this posting remains dead. What a strange, strange story. I cant imagine what the cop was thinking when he drove up and saw a man trying to revive a marsupial. This reminds me of world governments seemingly in a drunken stupor, trying to undo what they have done to nature. 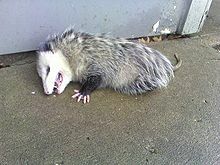 As a kid, I had the crap scared out of me by a possum that was playing dead. I decided to use a broom to sweep it out of the garage. As I started to sweep, it came to life. do unto possums what you would have them do unto you. Does the phrase “playing possum” ring a bell? Look, Donnie, I get a lot of mileage out of a funny story about my cousin when we were kids and a possum everyone thought must surely be dead. We all thought it was funny when a 20 pound pissed off and hurt possum came to life as he carried it over his back by its tail. He didn’t. I’m sure the possum wasn’t thrilled either. But we were laughing our asses off. So next time you want to revive roadkill, might I suggest that first mouth to mouth attempt be on an animal not known in common knowledge for playing dead without being dead. Unless you just like that sort of thing. I’m just sayin’ . . .